Pricing gets less attention on this blog. It is fascinating and I read about it a fair bit but clearly am no expert. Todd Slattersten, however is. He has written an ebook on pricing strategies. It is short and well written. I particularly liked the bit about how pricing is by far the most effective lever that managers have in affecting profit. 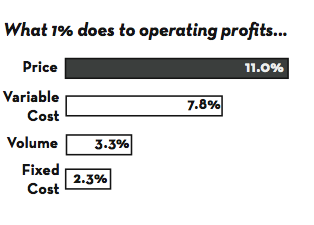 He refers to how a 1% increase in pricing can translate to 11% increase in profits. (It is also the easiest lever. I wouldn't advocate just upping the price to hit a quarterly target. Customers are not stupid and will eventually vote with their wallets). Anyway, worth a download and read. Here. I found it via Seth Godin. And if you like it, you'll probably also like The Art of Profitability too. Thank you so much for the mention and the link! I don't know about expert, but I am really glad it was helpful.